Twilight is a young-adult vampire-romance novel by author Stephenie Meyer. Twilight was initially rejected by 14 agents, but became an instant bestseller when published originally in hardback in 2005, debuting at #5 on the New York Times Best Seller list within a month of its release and later peaking at #1. That same year, Twilight was named one of Publishers Weekly's Best Children's Books of 2005. The novel was also the biggest selling book of 2008 and, to date, has sold 17 million copies worldwide, spent over 91 weeks on the New York Times Best Seller list, and been translated into 37 different languages. It is the first book of the Twilight series, and introduces seventeen-year-old Isabella "Bella" Swan, who moves from Phoenix, Arizona to Forks, Washington and finds her life in danger when she falls in love with a vampire, Edward Cullen. 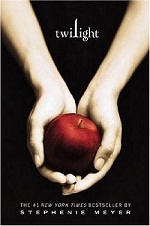 The novel is followed by New Moon, Eclipse, and Breaking Dawn. A film adaptation of Twilight was released in 2008. It was a commercial success, grossing more than $392 million worldwide and an additional $157 million from North American DVD sales, as of July 2009.